Thursday, October 7, 1982—it’s 18° and snowing this morning. Lots of geese flying east in the valley today. This is their fall migration. They fly mostly down to California, but some stop at different places along the way. Ray from Gunsight wanted the Cat again, but the pony motor carburetor is plugged. Then the carburetor on the chainsaw quit. I did get 1-1/3rd pickup loads of wood. It was a fairly nice day. Friday, October 8, 1982—went to Gunsight to hunt geese. The lake froze over during the night. Darrel and I went to Delta to goose hunt. Saw two herds of buffalo on a farm. We set out decoys wondering if the buffalo might tromp them or have fun with them but that didn’t happen. The geese had all left on the migration. We only saw one crane. Saturday, October 9, 1982—no geese, none flying. Some hunters killed a buffalo on the farm as they were hunting geese. I bought some grain for Hoffman’s goats and straw for my dogs for bedding this winter. I’m having trouble getting the saw fixed. Saw a wolverine and several fox today. It was storming part of the way home. Didn’t get home until after 11:00 p.m.
Wednesday, October 20, 1982—was a nice day, high 20’s, near 0° tonight. 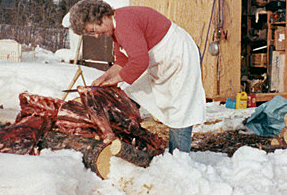 Cut up and packaged the caribou that Dan and Patti gave us. Cut up the buffalo liver (I found this liver out in a field up in Delta on the farm—it had been discarded by someone). I’ll use the buffalo liver for bait this winter. Visited Bob and Margaret Schmidt and had supper there. This entry was posted in Journal Entry and tagged butchered a caribou, no geese flying, Sylvia. Bookmark the permalink.